Over the course of the 1980s and well into the '90s, frozen yogurt boomed with popularity. Beginning with TCBY in 1981, dozens of brands began to pop up and flourish all over the country. Frozen yogurt replaced soft-serve ice cream as the quick, cheap dessert that you could squeeze out of a machine. By 1995, the United States was producing over 150 million gallons a year of frozen yogurt. But eventually, as many trendy tastes do, the American appetite for frozen yogurt began to wane. Brands began to go bankrupt and close their locations. New alternative deserts like freeze-dried ice cream pellets (Dip N’ Dots, etc.) were grabbing people’s attention. Old favorites like Italian ice (Rita’s, etc.) were roaring back into popular culture after their time at the bottom of the popular taste roller coaster. Frozen yogurt had always portended to be something of a “healthier” alternative to ice cream without coming right out and saying it, and eventually, the American public wised up and realized it was still frozen sugar, water and cream. A smoother consistency and the liberal use of the word “yogurt” can only get you so far before people wise up and start checking out your calorie count. Jump to 2005, when a young woman named Shelly Hwang, along with her business partner Young Lee, decided they were going to open their own frozen yogurt shop and call it Pinkberry. Just as the proprietors of frozen yogurt in the '80s distinguished their product as an ostensibly “healthier” option to ice cream, Hwang and Young sought to distinguish their product from traditional frozen yogurt by using limited but unique flavors and, most importantly, using Greek yogurt as opposed to traditional yogurt. Greek yogurt, with its tangy taste and non-traditional flavor profiles, purported to be a healthier option than regular frozen yogurt. They offered fresh strawberries and agave syrup as toppings instead of sprinkles and chocolate sauce. They opened their first location in North Hollywood, and it took off almost immediately with lines down the block. Its location naturally led to some high-profile celebrity customers, which quickly raised the company’s profile nationally. Within a year, the New Frozen Yogurt frenzy was officially on. Dozens of other brands began to pop up, most following Pinkberry’s model of using Greek yogurt and focusing on healthier topping options. 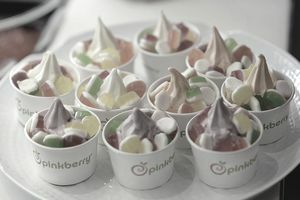 Pinkberry had also adopted a self-service operating model which some early competitors had begun using and which was now becoming the norm throughout the industry. Over the next decade, both Pinkberry and the Greek frozen yogurt industry as a whole saw exponential growth across the country. Between 2009 and 2012 Pinkberry went from 75 locations domestically to 225 locations worldwide. However, over the last five years that growth has started to stem as the market has been filled with competitors, many of which have gone back to a more “traditional” frozen yogurt offering and a significantly lower price point. Pinkberry continues to grow but at a significantly slower pace. The brand still has a devoted and loyal customer base, but it is unclear if the store’s cult allure can overcome its price point. While the average ticket price is $5.50, a large green tea frozen yogurt with 3 toppings costs nearly $10. Several years ago, there were 120 franchised Pinkberry locations domestically, down from previous years with most of the difference being bought back and run as corporate stores. Internationally the brand is doing slightly better, growing from 101 locations internationally to 122. The most recent figures indicate the franchise fee is reportedly $35,000, which is down from a reported $45,000 franchise fee. Start-up costs will vary per location, but the initial investment ranges from about $310,000 to $615,000, with cash liquidity of $200,000 and a total net worth of $400,000. Royalty fees are 6%; advertising fees are 2%. How Do You Buy a Dunkin' Donuts Franchise? Thinking of Opening a McDonald's Franchise?